I have mentioned that I don't set a definite shopping budget for myself, but I do keep obsessive track of my overall spending. I've tried both Mint and keeping an Excel spreadsheet, but I've found that You Need a Budget (YNAB) is the software solution that works best for me. The main advantage of YNAB over Mint is that while Mint is backwards looking, YNAB is intended to keep track of transactions in real time. If you're using it faithfully, you know exactly how much you have left to spend in every category for the month at any given moment. There's a mobile app that syncs with your data, which YNAB saves to your Dropbox, though I personally like to sit down and record my transactions on the computer. Also, YNAB primarily relies on the user entering each transaction on their own rather than being automated, which I've found helpful for keeping me accountable. I've used the software since last September and I haven't fallen off the wagon, though I dropped the ball a bit for two to three weeks in November. It was a pain and a half to retrace my steps and enter all my transactions from those weeks. It is best to make time daily for recording your transactions. Sometimes it is surprisingly difficult to remember what one was spending even a day or two ago. 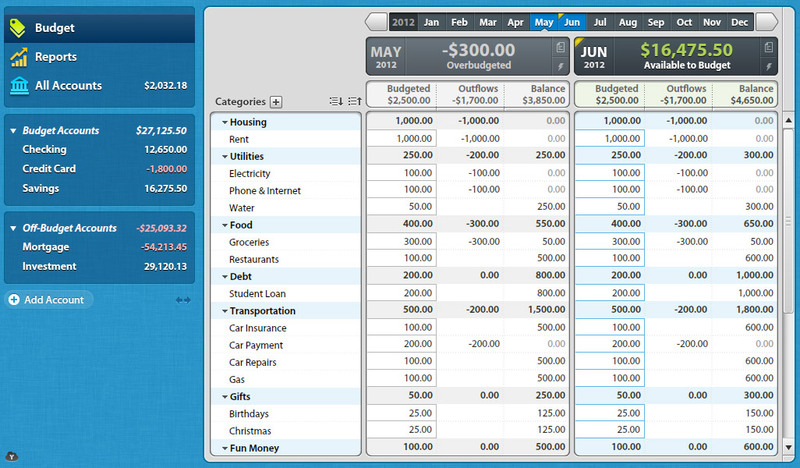 This is totally not my budget, but this is what the software looks like. As you enter transactions, the amount of each is deducted from the relevant category. Because my primary "income" is a loan disbursement at the start of the semester, I have personally budgeted out that money from January to May, which is not the norm for people with regular paychecks. It is difficult to fully explain how it works when the company can do it better and there's a reddit for it too. There is a bit of a learning curve, though I also find the software to be reasonably intuitive. You can and should "roll with the punches" within reason. If you overspend in one category, cuts likely have to be made elsewhere. When I find myself with an unexpected expense, I've found it helpful to immediately look over the rest of my budget and see what I can cut down on to accommodate it. Additionally, this might go without saying, but I should mention that the experience is completely defined by how you set your own budget and whether you factor in things like savings and investment goals. If you draw out your budget numbers in a way that doesn't fully allow you to meet your savings goals (like I did last semester), then it is no surprise that YNAB can't help with those goals. I feel sheepish about it now, but I only started setting aside an emergency fund and extra "savings" in anticipation of things like interview expenses and friends' weddings in January. If you are feeling inspired and don't want to wait for a sale, you can use my referral link here. You will get a $6.00 discount and I will get a $6.00 referral bonus. The software costs $60.00 full price. However, I highly encourage you to try the 30 day free trial first and to wait for a sale at AppSumo or on Steam. I bought YNAB during a 50% discount sale at AppSumo and the best price I have seen was a 75% sale on Steam last fall on either Black Friday or Cyber Monday.